It seems that every day, the Internet becomes “smaller” in size. Websites from foreign countries are always a click or two away, and many of them have important information. Of course, since most of can’t speak every language, we need translation aids. One of the most popular is Google Translate, and it’s great. You can type or paste in text, and it can usually discern the language of the text, then translate it into your default language. You can also give it a URL of a website in a different language, and it will translate it on the fly for you. Again, very handy. But sometimes doing that can be a bit of a chore. Maybe you want to simply click a word, phrase, sentence or paragraph, and see the translation right there. Well, you can do that, thanks to Inline Translator, a fantastic extension for Firefox. Of all the different translation extensions available, this one is probably the simplest, which is definitely not to say that it’s the most basic. In fact, in many ways, because of the simplicity, it’s the best. It may not have nearly as many options as some other extensions, but it still gets the job done. And a lot of times, that’s all that really matters. To install Inline Translator, first head over to the extension page at the Firefox Add-ons website. Then, click the big green Add to Firefox button to begin the installation process. Once the extension has installed, restart Firefox; when you come back, it will be ready to use. The first thing you’ll notice is the new icon in your toolbar. Inline Translator is now turned off. Click the icon again and it is back on. If you click the little arrow to the right of the icon, you’ll get the following one-item menu, in order to access the extension’s preferences. 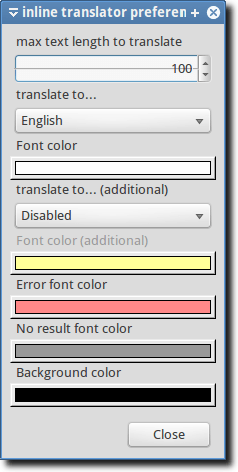 From the Preferences window, you can select how many words should be translated, pick a default language, plus change font colors in the event of an error or no result. Once you get Inline Translator set up the way you want, using it couldn’t be simpler. Just highlight text on a web page that you want translated, and Inline Translator kicks into gear, and translates it for you. When it finds its result (whether that result is translated text, no result, or an error), up pops a tool-tip style bubble. Inline Translation probably isn’t an extension you’ll want to leave running all the time, since it will otherwise attempt to translate any word you have highlighted. So despite the toolbar icon only having two purposes, it probably needs to stay. Otherwise, it would be nice to see an option to translate an entire web page. All this would need to be is for the URL to be copied, and a new window opened to Google Translate; this would be good enough. Another nice feature for the future would be to have Inline Translate only be activated when text is selected and then “Translate” selected from a right-click menu. Still, it does its job well enough. If you find yourself constantly needing translations, maybe keeping a tab open to Google Translate would be better, but for those times when you just need a word, sentence or paragraph translated, Inline Translator does the job well.